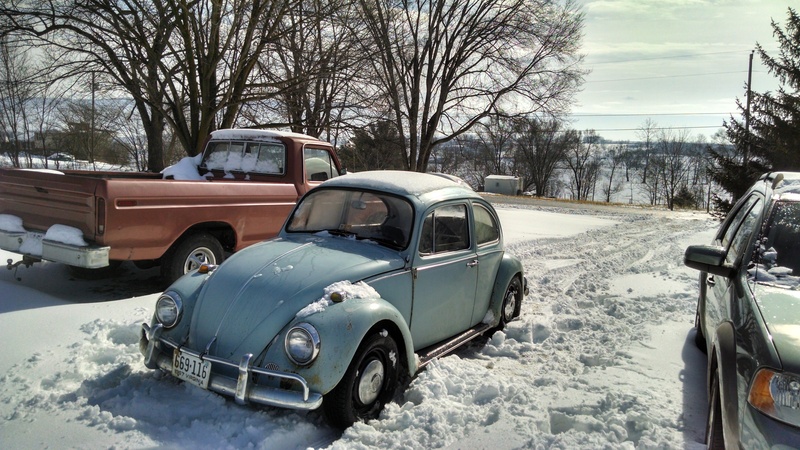 Sent over by reader of 1967beetle.com, Brandon Barnard. It’s a cold morning here in Austin, TX. Jay and I were talking about this earlier. If you think about it, these old cars were designed for the cold weather. Just a slight bump of the key, and I was headed down the road this morning. Are you seeing snow and ice in your area? Did you drive you ’67 Beetle to work today? I work in tech and don’t have time to grab YouTube’s embed code. :) Also, I wasn’t sure if your WP comments config allows for embedded HTML! It does, yes. I need to write a code based tutorial for users..
I’ve seen this video before and thought it was pretty cool but I thought it was interesting as to why VW chose to use a 67 VW to film a dramatization of a really bad snow storm that took place in 1970, to make a commercial about a 74 VW ? Hey Marius, what is the title of that video ? Love the VW snow plow video! I was in New England during the memorable storm of ’78 and, in my ’67 bug, delivered about 300 newspapers on my motor delivery route. It was just me and the snow plows in the wee hours that morning! Ryan, it’s ‘Very cool” literally! When I had my ’67 Beetle back in the ’70’s, I thought nothing of taking it to Mammoth Lakes or into Yosemite in the winter. The rear weight over the tires gives amazing traction. I went a lot of places other guys needed four wheel drive to do. p.s. Lobster claw seatbelt works perfectly. Thanks. Awesome! I love hearing these stories! They’re definitely cold weather cars. Mine loves to start up real quick when cold…and a little slower when warm. I keep mine out of the slush now, but it made many 44-mile round trips to work in all winter conditions. I’ve said if I strapped skis to the front wheels, there’s no place the Bug wouldn’t go in winter. Heater is another matter – I wore insulated coveralls and ski gloves, and kept an ice scraper on the passenger seat so I could drive and scrape the inside of the windshield as ice formed. Then little light crystals would float through the interior like it was snowing inside the car. Gotta love it. In Boise Idaho during the winter of ’84 we got pummeled by multiple snow storms. There was more than a foot on every road and snow plows had piled the crap head high in some places. Residential streets had un-plowed roads for many days. Later the temps dropped to almost 20 below in the late hours. But folks still wanted their pizzas delivered. So that is what I did. In my ’67 while almost every one else was grounded. With a trusty set of chains, engine weight in the back, and no radiator to freeze, the car had no problems getting through. Carburetor Ice: A winter time malady that one can occasionally experience with the Volkswagen engine/carburetor installation is carburetor icing. Those steeped in aviation mechanics or pilots are quite aware of this phenomenon-less likely the Volkswagen owner/driver. Aviation discovered the occurrence of icing in the induction system early on. Many aircraft have experienced the necessity of a forced landing due to carburetor icing, sometimes with disastrous results. There are several types of carburetor icing relating to aircraft piston engines, the two that likely occurs in the Volkswagen is the subject here. Fuel evaporation ice occurs when fuel is injected into the airstream from the carburetor throttle, as in float carburetors. The other type Throttle ice forms on the rear side throttle when the throttle is partially closed. The airflow across the throttle has a cooling affect on fuel air charge. Moisture freezes in this low pressure area and collects as ice on the low side (Volkswagen neck of intake manifold directly below carburetor). Fortunately throttle ice rarely occurs above a temperature of 38 degrees Fahrenheit. However in general, carburetor icing can form at most any temperature 32 to 70 Degrees Fahrenheit under certain atmospheric conditions-high humidity being a major condition. In small aircraft engines a carburetor heat control is provided, to direct warm air around the carburetor to melt the ice and or prevent it from forming especially during throttle closed conditions such as landing. The Volkswagen engine (1967) has something vaguely similar, the air cleaner pre heat flaps in both snouts of the air cleaner. However it warrants to bear in mind, that for the first few minutes of operating the engine, there is only Cold air flowing from around the cylinders and through the pre heat flaps and down into the carburetor/throat. I have experienced carburetor ice in many diverse locations, Norfolk, Virgina, Albany Georgia, North West Florida and other locations, it can occur anywhere. However the most severe was in the United Kingdom, noted for much moisture/humidity at times. Many times while working on my 67 in conjunction with running the engine, it would form ice on the intake manifold neck, about 6 inches worth, coating the entire circumference of the manifold. It would eventually kill the engine. On one occasion while driving to work early one morning, after about 600 feet and onto the main road, my trusty engine quit dead. The throttle valve was frozen partially open and ice coating the intake manifold throat. It took about twenty minutes to recover enough to proceed on. Information sources: Airframe/Poweplant Mechanics Poweplant handbook, Cessna 150 owner’s manual, personal experience as pilot /aviation mechanic and Volkswagen owner. Sir Quinn, What will be the remedy for this “Carb Ice” situation?